Why do we speak of a runaway greenhouse effect and where did the water on Venus go ? Just like the Earth, Venus used to have large amounts of water. In fact, this water came from volcanism. However, it has been completely evaporated due to the proximity of Venus to the Sun. Venus is 1.38 times closer to the Sun than the Earth, and so receives almost 2 times (1.91) the energy flux that the Earth receives. High temperatures provoke the evaporation of water. This is exacerbated by the fact that the boiling point of water depends on atmospheric pressure: at low pressure, water boils before 100°C, facilitating evaporation. It is possible that the pressure was lower, because degassing started later. And so the greenhouse effect began. Ultraviolet radiation then took over, making the greenhouse effect permanent. Water vapour is a gas that hugely increases the greenhouse effect – perhaps contributing 25 % to the Venusian greenhouse problem, and it is probably the origin of the runaway effect on the Venusian climate. UV radiation dissociated water vapour molecules into hydrogen and oxygen. Since hydrogen is lighter, it was rapidly (over 500 million years) removed by the solar wind; lost to space forever. The oxygen produced at the same time remained on the planet and combined with rocks in the crust , easily due to high surface temperatures. Runaway greenhouse effect on Venus. Once all the water was gone, carbon dioxide (CO2) contributed to the greenhouse effect. On Earth it is leached by rain and transported by surface water to the oceans where it is transformed into carbonate (shells and chalk) . But not on Venus! The CO2 remains in the atmosphere where it continually contributes to the greenhouse effect. In this way, Venus lost, over the course of 1 to 2 billion years, the water that it had gained from degassing over 500 million years. The ratio deuterium/hydrogen proves this fact. It is 120 times as high as on Earth. Deuterium, hydrogen’s heavier isotope, is lost to space less quickly, and thus it more concentrated with respect to hydrogen. 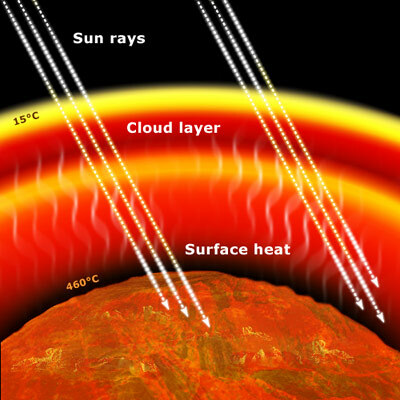 Why such a greenhouse effect on Venus? The original start of the greenhouse effect could be due to a period of tectonic and volcanic activity during the first billion years of the planet’s existence. The vaporisation into the atmosphere of a quantity of water equivalent to that of the Earth’s oceans, raising the temperature and provoking the degassing of carbon dioxide gave rise to the progressive amplification of the greenhouse effect. The water would then have been lost by dissociation and gravitational escape of the hydrogen. The Venusian crust must have been dried out even at great depths, so the water vapour currently present must come from residual degassing. This must have prevented the creation of plate tectonics such as on Earth, which could have occurred on Venus if it had had (and continued to have) a terrestrial climate with oceans. On Earth, the crust is constantly hydrated (and cooled) at the rifts (mid-ocean ridges) by the sea water. In absence of water, and at high temperatures, the Venusian crust can only have subduction, so Venus developed tectonics with one plate. If we suppose that in its early stages the planet underwent a period of intense volcanism, ejecting enough water vapour into the atmosphere to raise the surface temperature, this could cause the CO2 degassing and provoke a greenhouse effect so intense as to establish the current surface conditions. The possibility of much more intense tectonic and volcanic activity in the past, during the first billion years of Venus’ existence, is supported by measurement of the abundance of argon 40. As on Earth, this comes from the radioactive decomposition of potassium in the crust; argon produced very deep in the crust is degassed at the rate of tectonic activity. There is about four times less argon in Venus’ atmosphere than in the Earth’s. This difference may be due to the fact that the intense degassing period on Venus was shorter than Earth, maybe finishing 3.5 billion years ago. An what about the earth? The Earth could have suffered the same fate as Venus if it had been just one tenth of its distance closer to the sun (about 15 million km closer). On the other hand, had Venus evolved at the Earth’s orbital distance, then it would certainly have harboured life, as our planet did.